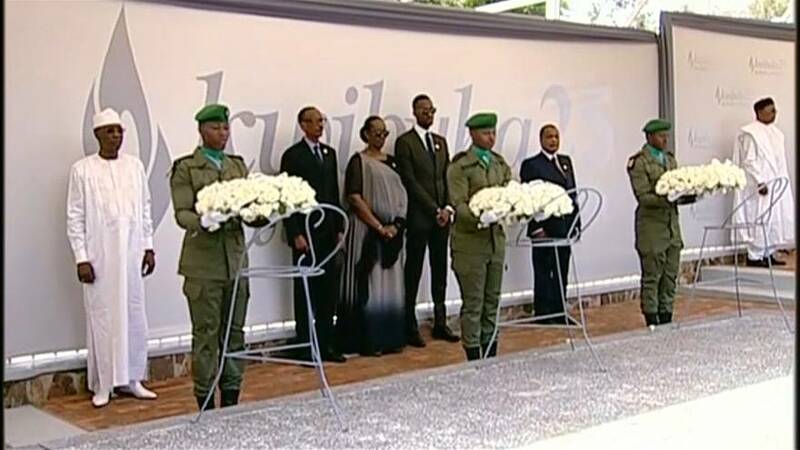 Rwandan President Paul Kagame and a number of visiting dignitaries attended a memorial ceremony on Sunday (April 7) to commemorate the lives of 800,000 Tutsi and moderate Hutus murdered during the Rwandan genocide, a three-month-killing spree that began 25 years ago. Kagame was joined by his wife and son, as well as several dignitaries including European Commission President Jean-Claude Juncker and Belgian Prime Minister Charles Michel. Following a wreath-laying ceremony, Kagame was among those who lit a commemorative torch at the Gisozi memorial site, on the northern outskirts of Kigali, where more than 250,000 of the dead are buried. In the afternoon, officials will join around 2,000 people in a "walk to remember" from parliament to the national soccer stadium, where candles will be lit in a night vigil. The 100 days of slaughter - with as many as 10,000 people killed daily - began on April 6, 1994 after President Juvenal Habyarimana and his counterpart Cyprien Ntaryamira of Burundi - both Hutus - were killed when their plane was shot down over the Rwandan capital. The attackers have never been identified.